Discussion in 'iPhone and iPad Games' started by wangyao500, Sep 14, 2016. 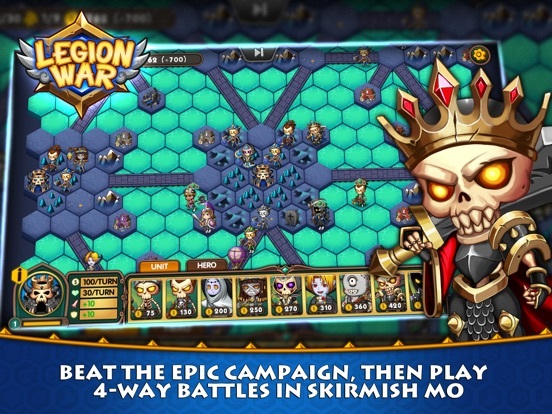 Legion War is a turn-based strategy game, brought to you from Bear&Cat Studio. 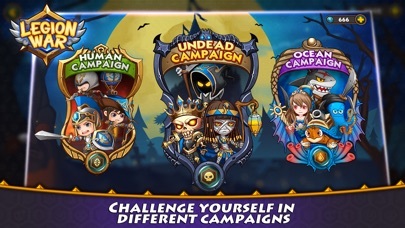 In this fantastic magic world, can you lead your legion to survive from enemies' challenge and write your legendary? >Campaign Mode - Play through 10+ well-designed levels with 4 difficulties,challenge yourself against super smart AI player. >Skirmish Mode - Choose from 30+ balanced maps, set up your own rules, and play against up to 3 AI players. 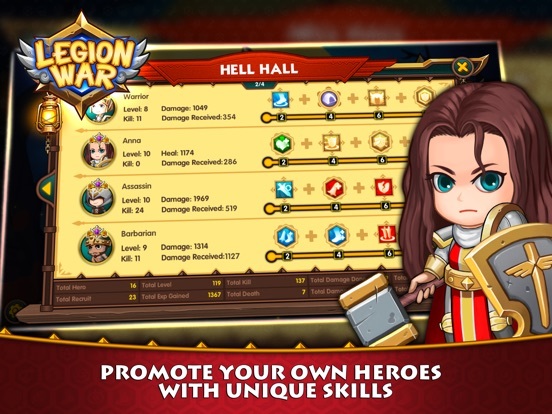 >Legion & Units - Take command of Human Legion with 8 unique units(Warrior, Archer, Barbarian, Assassin, Balloon, Cannon, Mage and Knight). Each Unit has its own upgrade route that contains 8 upgrade levels. 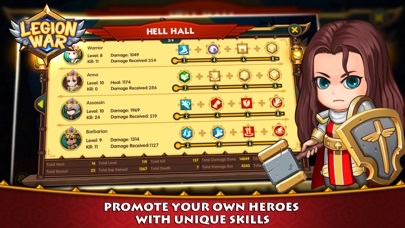 Promote your units and challenge stronger enemies. >Themes for Map - Lead your legion to fight in different themes of map: Ice World, Desert, Fire Land and Candy Paradise. >High Intelligence Game AI - The AI for this turn-based straight game has been designed for a long time. It has the ability to evaluate the situation of current battle, optimize attack plan and manage actions of each unit. The performance of Game AI are different in each Difficulty. 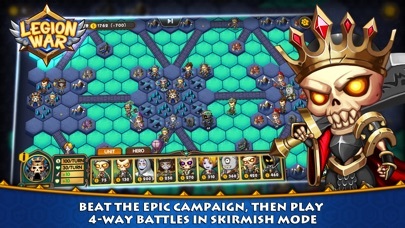 Can you beat the super smart enemy with your strategy and tactics? >Upcoming Legion - Undead Legion and Machine Legion will come in future. 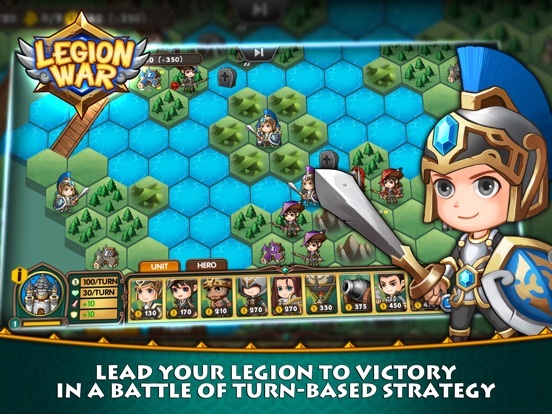 Legion War is a turn-based tactic strategy game, brought to you from Bear&Cat Studio. 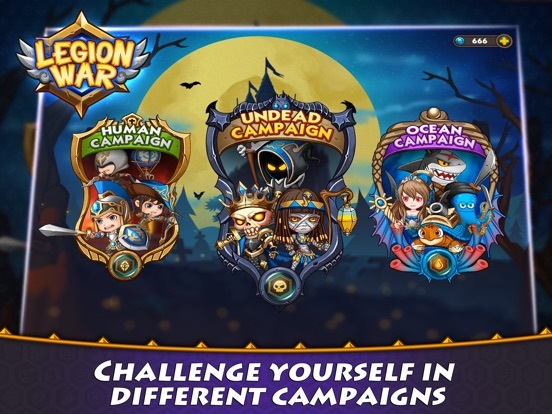 In this fantastic magic world, can you lead your legion to survive from enemies' challenge and write your legendary? 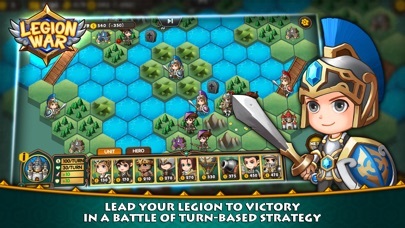 If you are interested in turn-based strategy games, SLG(Simulation) games, 4X games or strategy games like Advanced War, Ancient Empires, Lost Frontier and Civilization, you will be like this game. Features: >Units & Legion Currently we have 4 major legions human, undead, steam and wild. Each major legion contains 9unique units. And we also have a neutral ocean legion with 4 units. 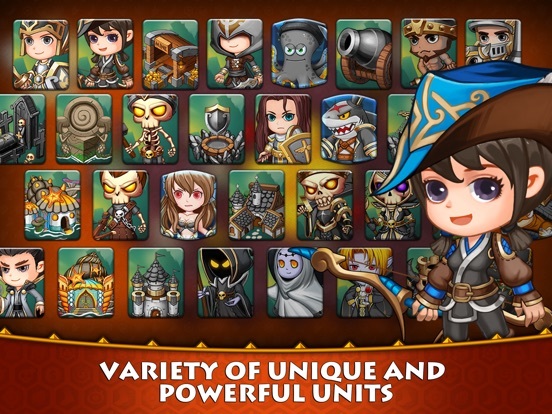 Every unit has different attribute and some of them have its own combat skill or passive skill. There is a unique upgrade route for each unit, upgrading a unit will make it become much more powerful and useful. >Campaign We have 5 well-designed campaigns along with each legion, more than 50 levels in total. 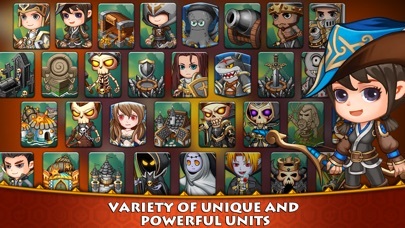 Units are being introduced in each level. Each level has a main task and three secondary goals to give extra bonuses if achieved. Complete level will give you some game currency which you can use to upgrade your units permanently. >Skirmish In skirmish-game you can set up your own rules and challenge AI players in various balanced game map. >Multiplayer You can play online game with your friend or other players. You can have a fair skirmish battle or a co-op custom campaign with others. >Map Editor Create your own maps and campaigns by in-game editor. You can share your maps to other players and you can also download variety maps & campaigns from our server. >Game AI The AI for our game has been designed for a long time. The performance of Game AI is different in each Difficulty. It has the ability to evaluate the situation of current battle, recruit the right units to counter your attack force, make attack plan and optimize actions of each unit. >Terrain Terrain is a basic element in turn-based tactics game. We have 8 different terrains - land, forest, hill, mountain, swamp, bridge, water and reef. Each terrain has its own modifier of attack, defense and movement cost. >Building There are many buildings in the game. Castle is use to recruit your unit and it also provide gold to you. Town is the basic gold production building. And there are many other buildings that have its unique function. >Map Theme Lead your legion to fight in different themes of map: Ice World, Desert, Fire Land and Candy Paradise. I'm the indie developer of this game. It's my first released game. Any feedback is welcome. Thank you. I'll try anything with strategy and a hex map! Can't make it work though. Pressed TUTORIAL button and nothing happened. Went into new campaign and pressed START; again no response. Pressed SKIRMISH and game locked up. Using iPad 4 with iOS 9. Please ignore above comments. Went back and reopened app and everthing is now working. Will post review in due course. Sometimes, when user first install this game it will get this bug. I'm working on it now. It seems to be caused by OS memory clean up. Thank you for playing. It's been working without any further problems. Only had time to play first two campaign levels, and I can see it's a fun light strategy game. Easy to learn; tutorial takes a couple of minutes, and then additional units are being introduced in each level. Tapping a unit shows movement and combat stats plus any terrain modifiers. Then it's a case of turn based move and attack, much in the spirit of Advance Wars. Buildings can be captured but I'm not sure what benefits they provide yet. I was surprised that units can move into water; probably there's a movement penalty. Graphics are sharp and individual units easily identifiable. AI is targeting my weakest units, but sometimes will retreat. Units level up automatically. Each level has various secondary goals to give extra bonuses if achieved. It's all very accomplished and I'll be spending more time with this. Thank you for your review. Buildings will provide gold for you every turn, and also have strong terrain modifiers. You can tap that "i" button beside the unit/building image to see the detail information, including full attributes, terrain modifiers and movement cost for that unit. I will keep improving my game. Thank you for your review, any suggestion of improvement? Feature of speeding up will be available in next update. And I'm working on new legion - undead legion( include 8 new units). There will be a healing unit. Thank you for playing my game. It's free because, I like TBS game and I just want to make my own game and share to everyone who is interested in TBS game. Thank you for downing and playing. Any feedback will be appreciated. You should maybe get some help with the game discription. The game looks good though. Downloading as I type.